As mentioned earlier the Okrasa installations for Karmann Ghias did evolve during the years. In the 1957 Carl Theodor Kleine VW accessories catalogue an installation is shown that is in-between the 1956 and the 1958 versions showed in the earlier blog-post. My guess is that the catalogue was made late 1956 or early 1957), before the introduction of the TSV1300. 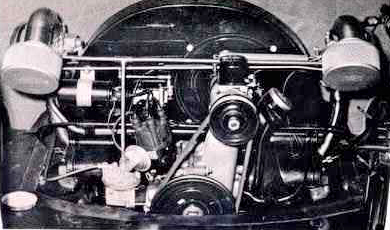 As can be seen the installation has the "newer" style routing of the ignition cables and the rear mounted balance tube. However, the installation show no oil filter and the air filters are of the older Knecht type. Also note the position of the coil that differ from all three previously shown. Looks neater according to me.